MOSCOW, January 11. /TASS/. Russia will continue to develop strategic partnership with Venezuela following Nicolas Maduro’s inauguration and will render economic help to this Latin American country, the Russian Foreign Ministry said in a statement on Friday. "For our part, we confirm the intention to closely cooperate with friendly Venezuela, its nation and lawful authorities. We will continue to consolidate relations of strategic partnership, which, as the recent negotiations between the leaders of our countries showed, are stably developing in all areas of mutual interest," the Russian Foreign Ministry noted. "We will continue to render support to Venezuela in overcoming the difficult economic situation." Washington’s policy of creating alternative government agencies in Venezuela is a blatant encroachment on that country’s sovereignty, the Russian Foreign Ministry said in a statement. 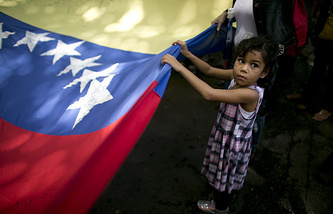 "Washington’s barefaced line aimed at the unconstitutional creation of alternative government agencies in Venezuela, attempts, defying reality, to designate some Venezuelan government bodies are legitimate and refusing to recognize others as such, tightening the stranglehold of sanctions exacerbating the socio-economic situation and hitting ordinary Venezuelans’ pockets is undisguised encroachment on Venezuela’s sovereignty," the statement runs. On Thursday, Nicolas Maduro who had won the presidential race in Venezuela assumed office as the head of state. He was sworn in in the Supreme Court rather than in the National Assembly (unicameral parliament), which has been controlled by the president’s political opponents since December 2015. The US considers the National Assembly to be the only legitimate authority in Venezuela.